IMAGE: The Great Western Greenway uses stop signs and bollards at local roads, while Kerry is using chicanes with gates at driverways. — Gate-chicanes closer to junctions than recommend in guidelines. — Chicanes and yield signs at private driveways. — Greenway gives up in Caherciveen, mixes with motor traffic. 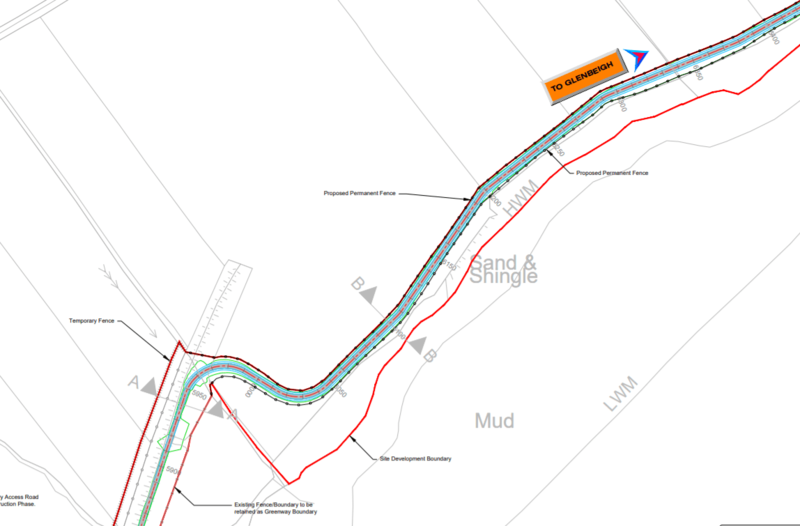 — Cyclists to be asked to dismount outside pub and two houses. 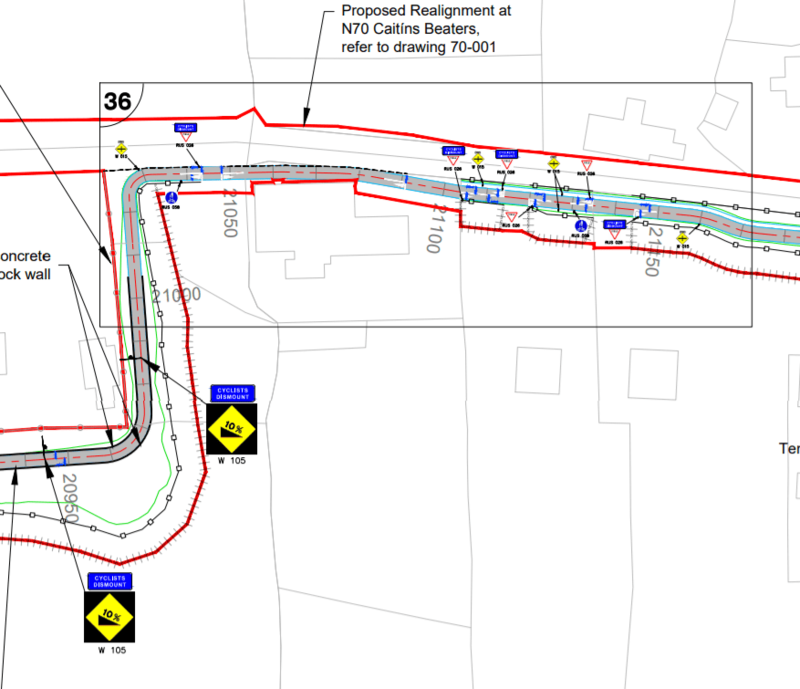 Detail designs for the South Kerry Greenway — which follows part of the Ring of Kerry — shows that Kerry County Council have gone against the Greenway Strategy just weeks after it was published. 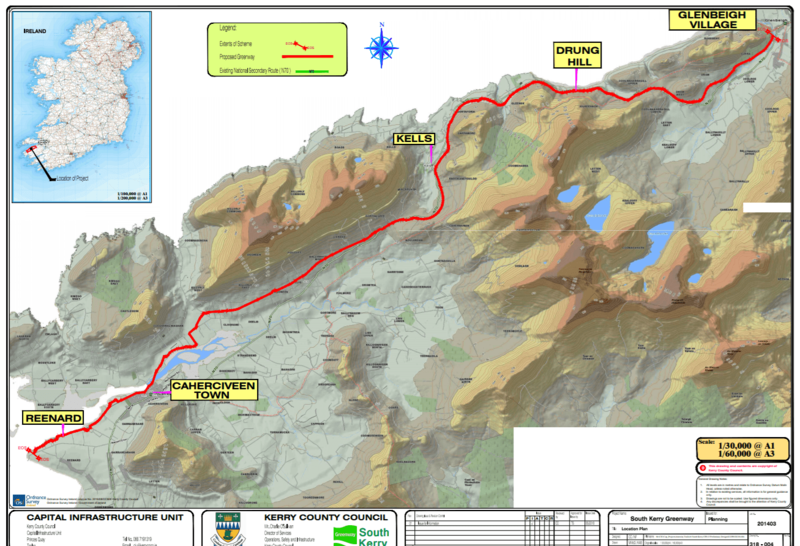 Last week Kerry County Council lodged the planning application for theSouth Kerry Greenway with An Bord Pleanála. The 32km route runs from Glenbeigh to Reenard in south Kerry. The Greenway Strategy outlines how routes should follow the TII Rural Cycleway Design (Offline) for rural sections and the NTA’s Cycle Manual on urban sections. 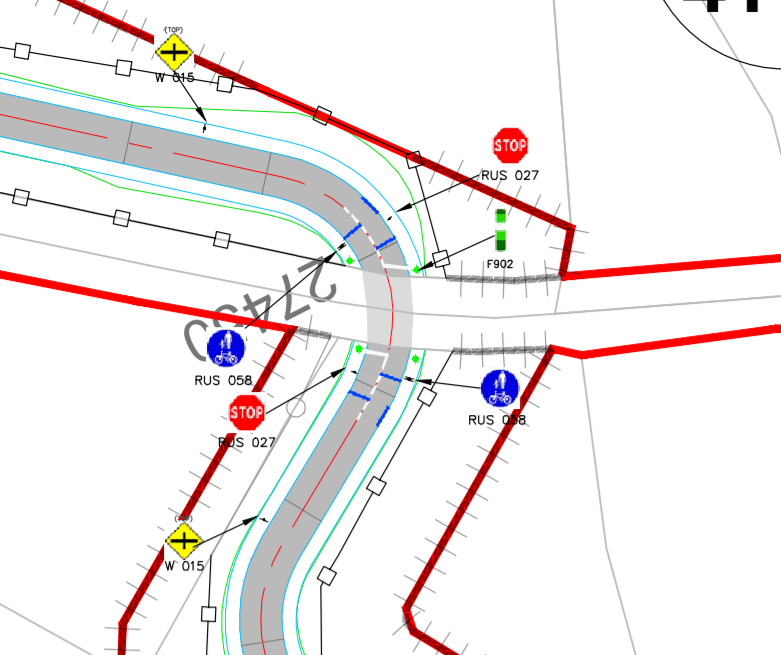 But the council has gone against those documents at junctions and not having 10 metres space between junctions and, in many locations, having fences or dips right beside the greenway path. I n Caherciveen, rather than providing a greenway suitable for urban usage including between housing estates and schools and workplaces, the council mixes the greenway route on a local road. It is one of the viewed to be the first greenway in Ireland to use the Compulsory Purchase Order (CPO) process for the acquisition of the privately-owned lands to allow the council to develop the greenway. The council said that submissions on the order must be lodged with An Bord Pleanála by 19 October next and An Bord Pleanála may decide to hold an oral hearing having regard to any submissions received. Details, including drawings, can be found at kerrycoco.ie. 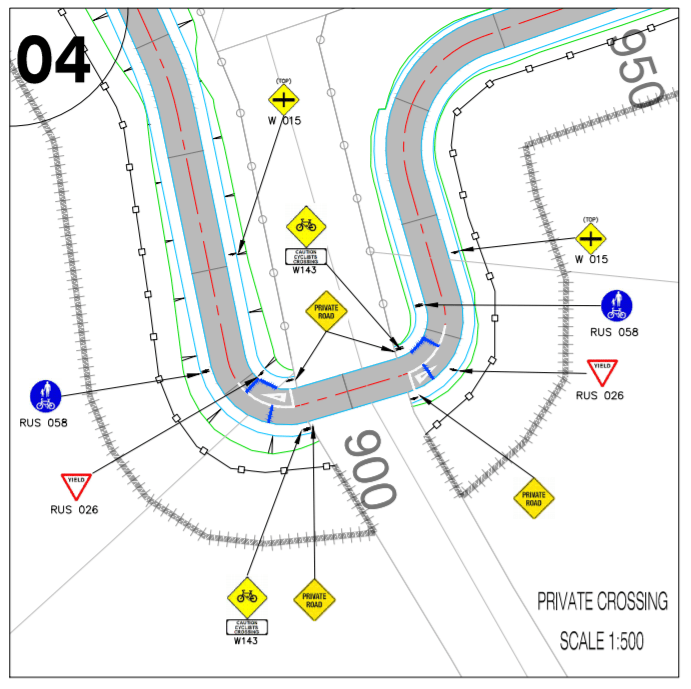 Private road junctions over driveways into single houses — at all driveways the greenway includes chicanes and yield signs aimed at greenway users — a reverse of priority than is normal when a driveway meets a public road or path. Where the route meets Caherciveen, no footpath is provided beside the greenway path and no increase in width seems to be provided for. I would imagine designs were well advanced by the time the DTTAS strategy was published. Perhaps if the publication of the strategy wasn’t delayed there would have been more lead in time to ensure designs were in line with same. Chicanes do serve a purpose from a H&S perspective though, personally, road humps which give priority to walkers and cyclists, in conjunction with signage, are much more preferable to the greenway user. @JH the rural cycle route standards (which are good in some ways, but overall far below what’s needed) was already indicated as the standard needed to be followed for rural routes. All design standards require relaxations and departures in some scenarios. The chicanes are weird though! Trevor — in line with policy to get children cycling to schools, people cycling to work etc, they could have used the opportunity to provide a safe, segregated cycle route in the urban area. 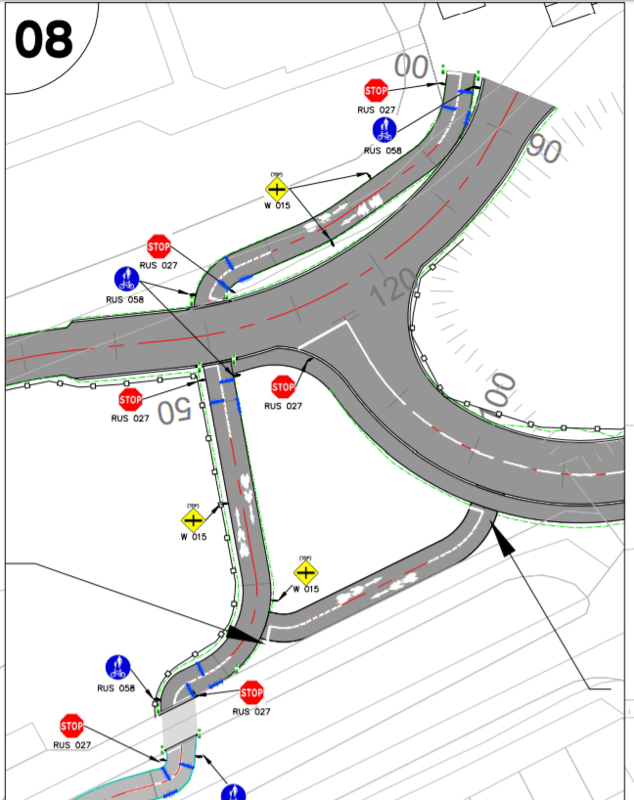 Also no traffic calming is provide, so, it’s not in line with that relaxation and the Cycle Manual isn’t follow. And — totally apart from the greenway standards — the Design Manual for Urban Roads and streets isn’t followed. 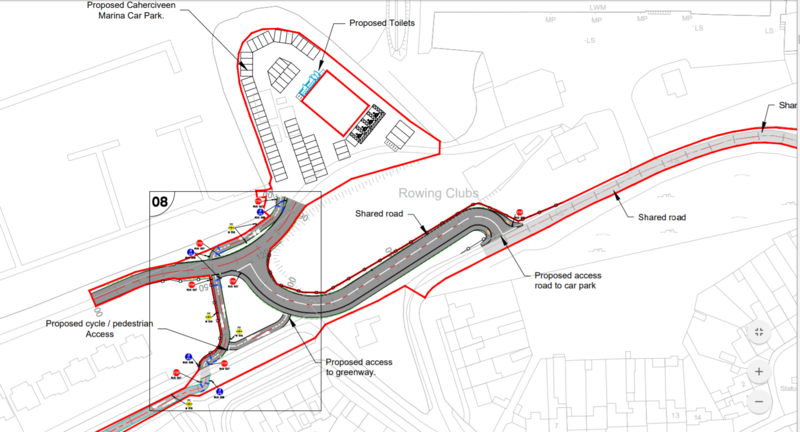 The design issues highlighted support the impression that many of these so called “greenway” projects have little to do with cycling or walking and are simply a “scramble for money” from the local authorities involved. I don’t think that this proves it’s all about the money and they don’t care about cycling or walking. I do think it’s typical of the attitude where when something gets even a little bit difficult whoever is in control just does whatever is easiest and/or cheapest. The classic example of this is the way we have so many nice cycle lanes along grand wide roads but as soon as the road narrows or there’s a complicated junction (where we actually need cycling infrastructure) the cycle lane just ends, to be continued whenever it gets easy again. The most offensive thing in the list above is the requirement to yield at private driveways. I’d be interested to see the reaction if someone suggested adding yield signs to the main carriageway so that people could get out of their houses. Hello, I am a cyxlist. I am also from South Kerry. This Greenway has been on the table for over a decadeeand negotiations amd planning start d ling before any National Cyxelway Strategy was even spoken of. That context is important. The vast majority of local people, based in S Kerry (Cahersiveen, Ballinskwllogs, Valentia, Portmagee, Dromid, The Glen, Gaeltacht Uíbh Ráthach, Waterville, Derrynane, Kells Bay/Foilmore) are hugely supportive of this Greenway and have been so for almost a decade. Those of us who were forced to leave our homes, our communities and our families due to forced ecinomic emmigration) are also hugely supportive of project. It is the only only immediate solutiin to the haemorrhaging of our youth from this Region of National and International importance. UNESCO world heritage site of Skellig Mochael is off our Coast. We are very gratefiul for the work and efforts of Kerry Co Co and the vat majority of landiwners who have generously consented to this development in the interests of the future of their Hime , traditions, their cultire and their families for generarikns to come – hopefully……..That is the big picture, that is the urgency, that is the cintext. A yield sign or a grass margin or other technical issues can be discussed but it’s certainly not a good enough reason to even suggest a project of this nature should not go ahead. It’s important you have context. Hello June Andy O’Connell, none of the above issues covered above a reason to even suggest a project of this nature should not go ahead and that’s not the intent of the article. 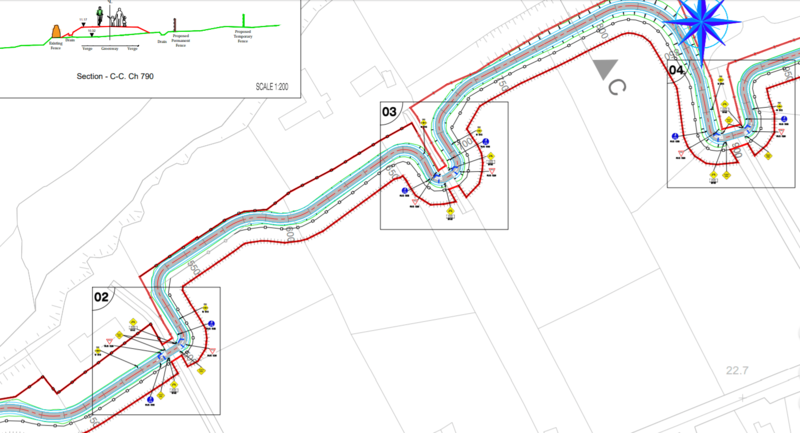 It’s worth nothing, however, that the the design as presented goes against (weak) rural cycle route design standards which have been in place years before the drawings were signed off on. It is good news that the Youghal Midleton Greenway has got the go ahead and good to see the Caherciveen proposal making headway. It is good to see some of these redundant railway facilities being reused for the benefit the communities. I think that they should be further used as tourist attractions for those who do not cycle or walk. That is use them as tracks for rubber tired tourist trains. In this case tourist could take a little train sightseeing trip from Caherciveen to Glenbeigh or vice versa. It is scenic and the most westerly railway histories in Europe. This would not prevent walker or cyclists using the facility but would help to get more out of the facility. We built a tourist train (antique steam look) for use in Cork City and looking for further operating opportunities for this type of tourist/visitor business.